460 Squadron RAAF Lancaster ND968, AR-O "Oboe" lurches violently into a downward spiral after being hit over Alsace by another Lanc, which falls away to its doom. Along with other bombers, this crew had climbed above their briefed altitude to escape thick cloud and bad turbulence on their way to attack Munich on 7 January 1945. Their Lancaster was ripped apart along the trailing edge of the starboard wing, jamming the ailerons, and through the middle – obliterating the H2S radar and its dome and almost severing the whole tail section, which started swaying alarmingly. Remarkably it held together as they returned to England and made a long, flat, flapless approach to the emergency field at RAF Manston. The other Lancaster was most probably NN766, PM-R of 103 Squadron, which crashed with the loss of all seven crew about 23 miles away. 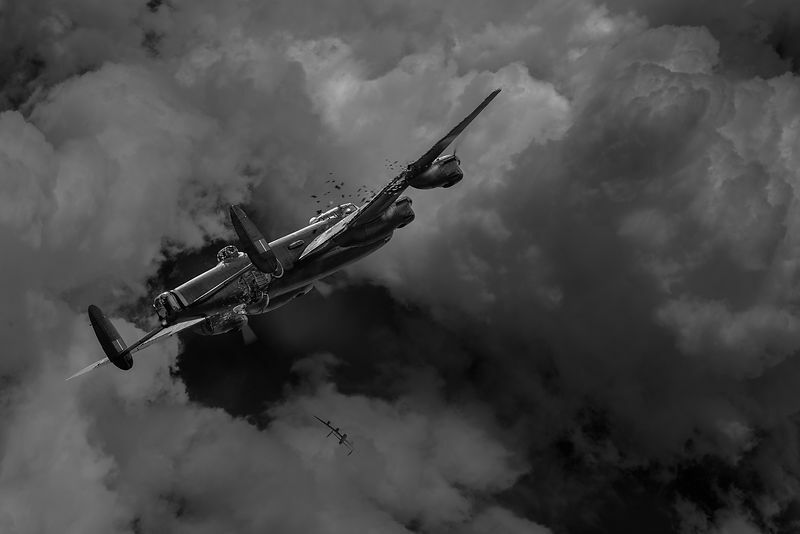 This Flight Artworks depiction of an incident that RAF Bomber Command crews flew in fear of, in their loose formations at night in poor weather, was commissioned for the RAF Memorial Flight Club autumn journal 2017. This article discusses how I created the picture.